Olivia Cleans Green: Drying Catnip is So Easy! I must confess, I'm not great about preserving bunches of fresh herbs. In fact, I am terrible. I use as much basil, rosemary, parsley, or mint as I can tolerate until it goes pale green or black, then toss it in the food scrap bag for future composting. Yes, I know this is terrible behavior as I am wasting environmental resources and money. 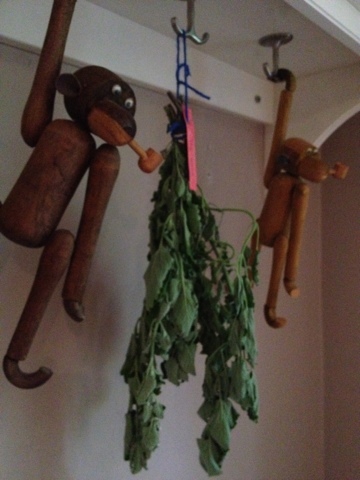 Catnip hangs to dry in the company of monkeys. Yesterday, we got fresh catnip in our CSA share yesterday. My cat Lucy went bananas! She loves catnip so much! Seeing how much joy Lucy got out of her farm fresh catnip, I knew I couldn't let it spoil. I decided to dry the rest of the bunch. It was already bundled together with a rubber band so I just tied a string to the bundle and pulled a label through the string. According to You Grow Girl, it's important to hang the bundle in a well ventilated area, out of direct sunlight. I hung my bundle from a random hook in the corner of my living room. If all goes well, I'll have mold-free dried catnip in two weeks. (I'll be sure to let you know what happened.) In addition to watching Lucy go wild, I'm looking forward to drinking warm mugs of catnip tea before bedtime this winter. According to WedMD, Catnip is known to be a gentle sedative for humans. It's also used to treat headaches, colds, fever, and indigestion, among many other health conditions.